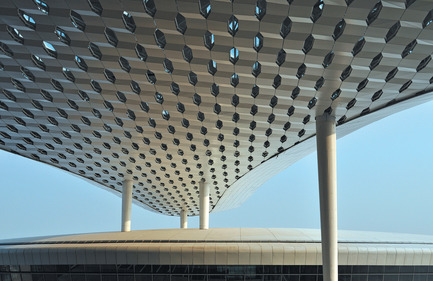 London, United Kingdom, 2013-11-26 - The highly anticipated new terminal at Shenzhen Bao’an International Airport, Guangdong, China, will be operational from the 28 November, 2013. 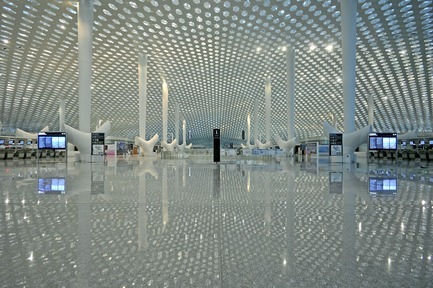 The first airport by acclaimed architects Massimiliano and Doriana Fuksas it is set to become an iconic landmark that will boost the economic development of Shenzhen - one of the fastest-growing cities in the world. 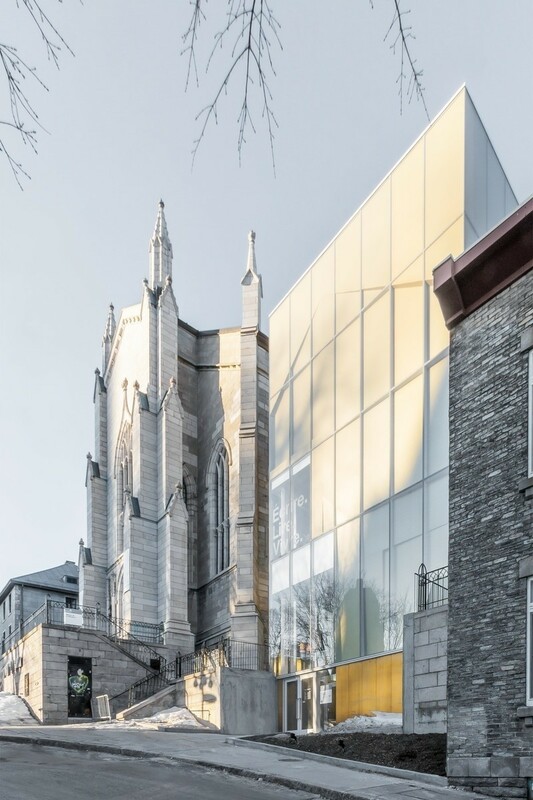 Won by international competition, it has undergone a remarkably rapid process of design and construction, completing within 3 years. The client, Shenzhen Airport (Group) Co., is so pleased with the striking design that it is taking the unusual step of trying to copyright it. 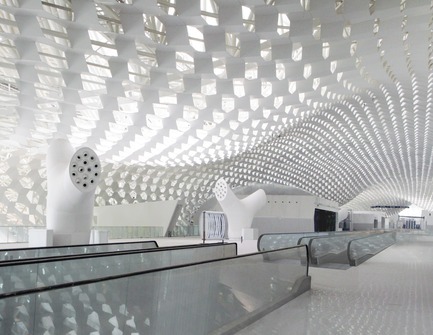 The terminal – the largest single public building to be built to date in Shenzhen - encompasses 63 contact gates, with a further 15 remote gates and significant retail space. It will increase the capacity of the airport by 58%, allowing the airport to handle up to 45 million passengers per year. The sculptural 500,000 sq.m. / 5,381,955 sq.ft (approx.) 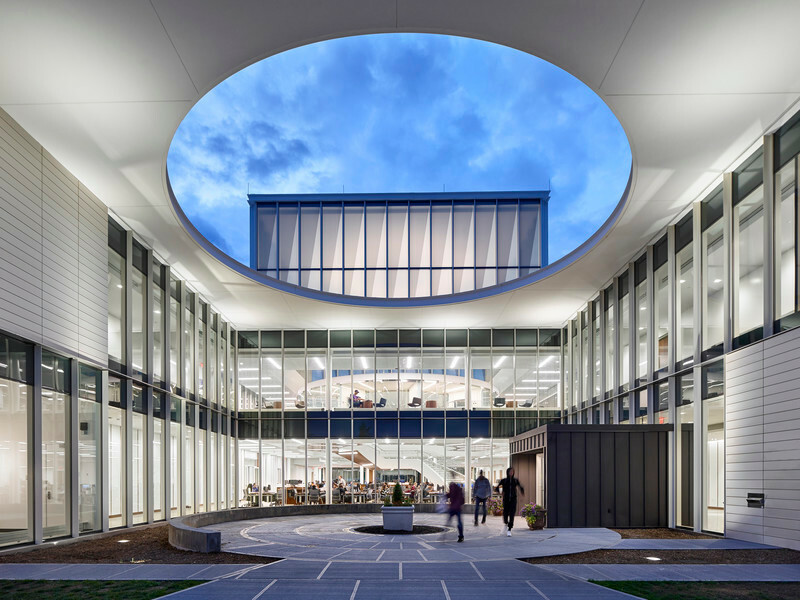 terminal, evokes the image of a manta ray and features a striking internal and external double ‘skin’ honeycomb motif that wraps the structure. At 1.5 km long, with roof spans of up to 80m, honeycomb shaped metal and glass panels punctuate the façade of the terminal allowing natural light to filter through. 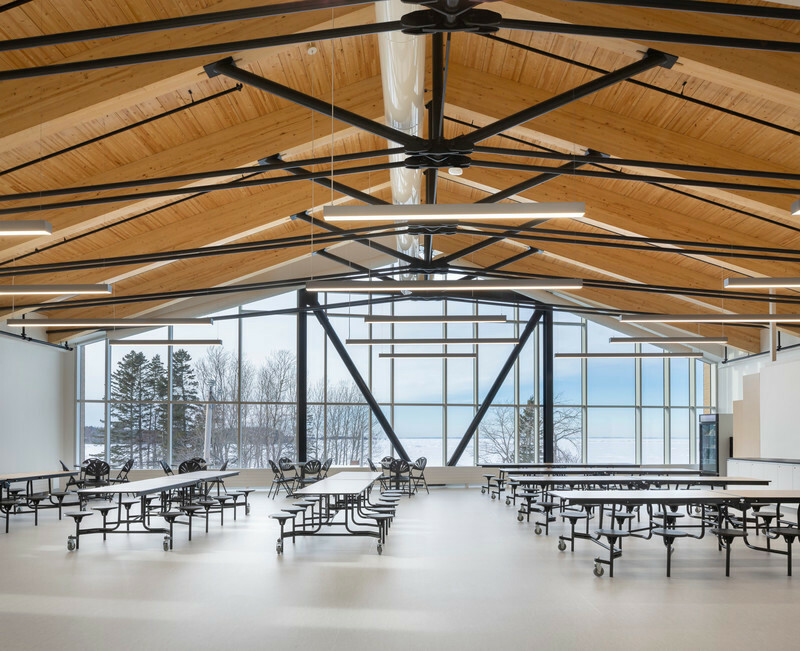 On the interior, the terminal is characterized by distinctive white conical supporting columns that rise to touch the roof at a cathedral-like scale. 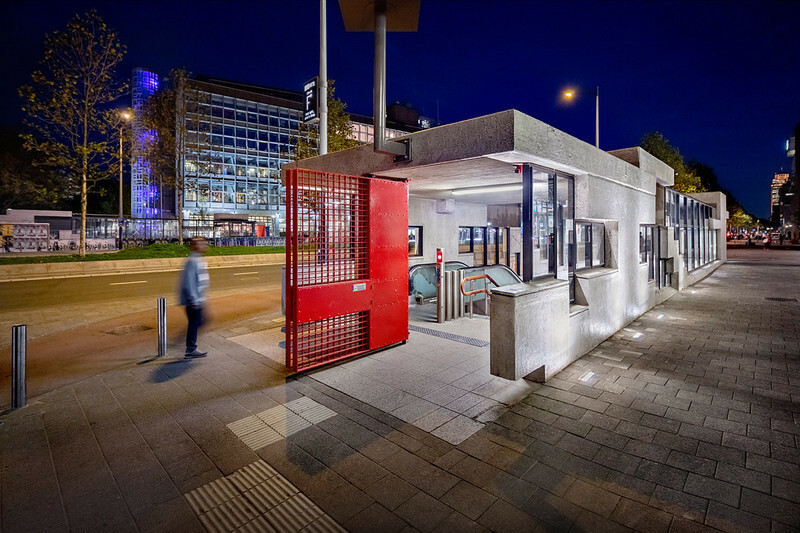 The focal point of the design is the concourse located at the intersection of the building. 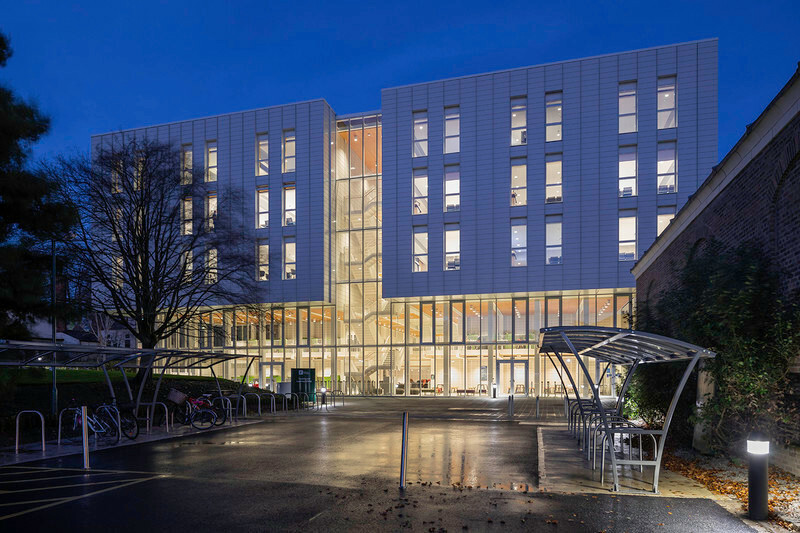 Consisting of three levels – departure, arrivals and services – they vertically connect to create full height voids, allowing natural light to filter from the highest level down to the lowest. Studio Fuksas has created an interior, as striking and elegant as the exterior. The spatial concept is one of fluidity and combines two different ideas: the idea of movement and the idea of pause. 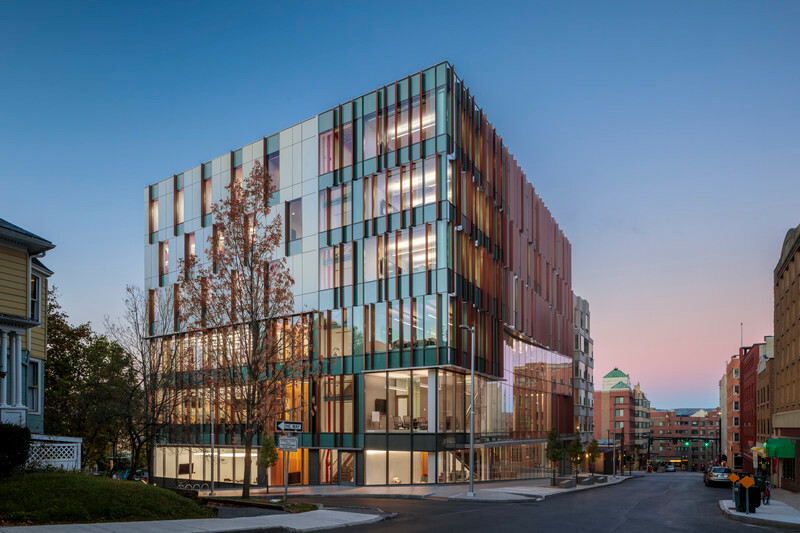 Carefully considering the human experience of such environments, Studio Fuksas focused on processing times, walking distances, ease of orientation, crowding, and availability of desired amenities. Stand-out features of the interior design include stylized white ‘trees’ that serve as air conditioning vents, and check-in ‘islands’, gates and passport-check areas with a stainless steel finish that beautifully reflect the honeycomb patterns from above. The honeycomb motif translates through into many aspects of the interior and at different scales – from the larger retail boxes to smaller 3D imprints in the wall cover. Shenzhen as a booming business and tourist destination, and will bring benefits to the region as a whole. 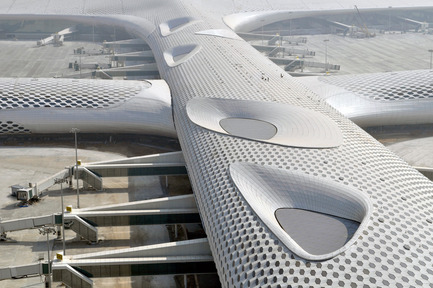 Studio Fuksas are engaged on two further phases of the airport extension, scheduled to complete in 2025 and 2035 respectively. Client: Shenzhen Airport (Group) Co., Ltd.
Materials: Steel with a concrete substructure. 52,000 tonnes of steel was used, with an additional 260,000 tonnes of reinforcement. It has won the ‘Steel Gold Award (National Quality Engineering)’. 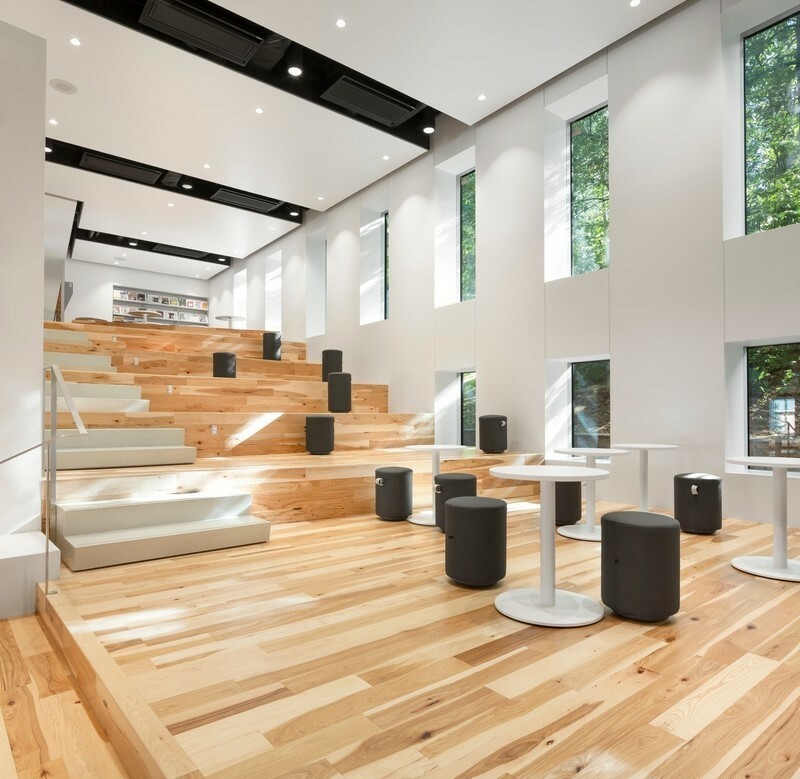 Sustainability: The design has been optimised to make best use of natural ventilation and light. Photovoltaics will meet the electricity demand of T3, making about 950 million electricity units each year. Future photovoltaic generation is expected to reach a capacity of 10MW that will be used to support the electronic devices of the entire airport. Orientation: The main building includes two-storey underground and four layers above the ground (partial five storeys). The fourth floor is the departure hall. The third floor is connected with the domestic departing passengers channel and the center of it is the international joint inspection zone, luggage collection/checkpoint and the office area located on both sides. The domestic passage channel, luggage claim hall and part of the office area are on the second floor. At the north east part of the first floor is the international departure hall. Its center is used for the international joint inspection zone and also the luggage claim hall. In front of the first floor stand the CIP lounges. Between it and the main building stands the outdoor courtyard. Studio Fuksas, led by Massimiliano and Doriana Fuksas, is an international architectural practice with offices in Rome, Paris, Shenzhen. The practice employs around 170 professionals, including architects, designers, modellers, landscapers, graphic designers. With built projects across Europe, Asia and North America, Studio Fuksas is characterized by an innovative approach as well as interdisciplinary skills and experiences consolidated over three decades through the design of: masterplans, offices, residential buildings, infrastructures, cultural centres, leisure centres, retail developments, hotels, shopping malls, public buildings, interior design and product design. Every stage of each project, from concept to planning to construction, is carried out in close contact with the Client. Depending on the peculiarities of each project, a team is created and co-ordinated by a project-manager that interacts with professional engineering consultants under the direction of Massimiliano Fuksas. Regular internal meetings are aimed at discussing on-going projects as well as promoting dialogue, creativity and common solutions. The planning phase makes use of a models room technologically equipped for the construction of multiple scale architectural models in different materials to provide an effective tool for both an overall and highly detailed display of the project. Of Lithuanian descent, Massimiliano Fuksas was born in Rome in 1944. He graduated in Architecture from the University of Rome “La Sapienza” in 1969. Since the eighties he has been one of the main protagonists of the contemporary architectural scene. He has been Visiting Professor at a number of universities such as: Columbia University in New York, the École Spéciale d'Architecture in Paris, the Akademie der Bildenden Künste in Wien, the Staatliche Akademie der Bildenden Künste in Stuttgart. From 1998 to 2000 he directed the “VII Mostra Internazionale di Architettura di Venezia”: “Less Aesthetics, More Ethics”. Since 2000 he has been the author of the architecture column - founded by Bruno Zevi - in the Italian news magazine "L'Espresso". He works and lives in Rome and in Paris. Doriana Fuksas was born in Rome where she graduated in History of Modern and Contemporary Architecture at the University of Rome “La Sapienza” in 1979. She has also earned a degree in Architecture from ESA, École Spéciale d'Architecture, Paris. She has done didactic activities at the Institute of History of Art at the Faculty of Letters and Arts and at Industrial Design Department ITACA at “La Sapienza” University in Rome. She curated four “Special Projects” at the 7th International Architecture Exhibition in Venice: “Less Aesthetics, More Ethics” in 2000: Jean Prouve’, Jean Maneval, the Peace Pavilion and Architecture of Spaces, and the contemporary art section. She has worked with Massimiliano Fuksas since 1985 and has been director in charge of "Fuksas Design" since 1997. Shenzhen is located on a southern tip of the Chinese mainland and on the eastern bank of the Pearl River. It neighbors Hong Kong. One of China's gateways to the world, Shenzhen is one of the country's most developed cities and one of the fastest-growing cities in the world. It is one of the most important industrial locations as well as a very popular tourist destination in China. 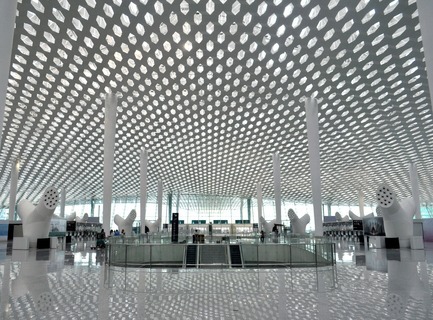 Shenzhen Bao'an International Airport is the fourth largest following Beijing, Shanghai, and Guangzhou in China. The 500,000 sq.m / 5,381,955 sq.ft (approximately) terminal will be built in three phases, with the final elements completed in 2035. The masterplan for Shenzhen Bao’an International Airport intends to offer world-class transportation services. 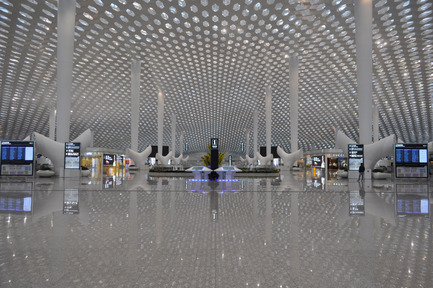 Achieving this means that Shenzhen airport must be operate at the following levels: Globally - T3 at Shenzhen Bao’an International Airport must serve as the global aviation gateway between China and the rest of the world. Nationally - as the fourth largest following Beijing, Shanghai, and Guangzhou in China, Shenzhen Bao’an International Airport is a trunk of domestic flights and hub of national flights. Enhancement of transfer services between international and domestic flights will improve the distribution of wealth among all Chinese cities. Regionally - Currently, there are more than 40 cities with populations of over one million within 3.5 hours flying time of Shenzhen. This makes Shenzhen an excellent location for a regional hub. Passengers travelling from neighboring cities could fly to Shenzhen to connect with long distance global flights or flights to other Asian cities. Phase 1 (in 2013) - Major facilities in Phase 1 include the unit terminal with 63 contact gates plus 15 remote gates, the first stage of the APM, traffic system, parking place, landscape, and shopping centre. Train service for APM will not be available until the completion of Phase 2. 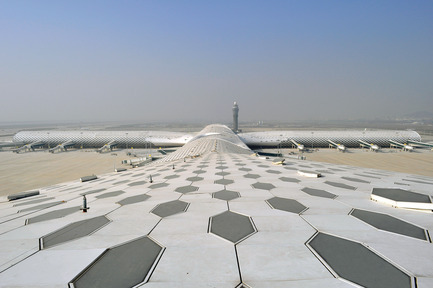 T3 was designed to accommodate 45 million annual passengers, which includes 36 million domestic passenger's trips, 9,000,000 international passengers. It is expected to have its visitors of 13,716 per hour during peak periods and the annual aircraft landing and takeoff will be 375,000. Phase 2 (in 2025) - Expansion after Phase 1 will occur based on masterplan. During Phase 2, the first remote passenger concourse will be constructed to add gates and the satellite terminal with rail stations will be operational. This will require expansion of the APM. Phase 3 (in 2035) - Development of the airport’s west side will continue until about 2035 when T3 Shenzhen International Airport will be fully constructed. Phase 3 continues the demand driven development process. The satellite terminal will again undergo expansion and more remote concourse will be added during this decade. And also there will be expansion of the Terminal head house. The volume of extension of the Terminal head house is going to be glass facade with glass roof so that the extension of building can have continuity in terms of construction material. Consequently this way of extension can have merits not only for the aesthetic reason but also for construction. Designed for maximum flexibility to cope with the unpredictable nature of the aviation industry, like its predecessors, it aims to resolve the complexities of modern air travel, combining spatial clarity with high service standards.